I finished the Honey Cowl for my sister the other night (just in time for her birthday!) and so I am working exclusively on my Edith Shawl now... I would like to give it as a gift to a friend who is getting married on January 27th. I have about 50 more inches to go, so I have my work cut out for me! I am reading a lot right now: The Constant Princess (which is feeding my interest in King Henry the 8th and his wives), Drawn from New England: Tasha Tudor, a Portrait in Words and Pictures, Ramona and Her Father, and The Felicity Story Collection (we're about to start the third book in the series). This site has free patterns (click on the Free Pattern Gallery link). 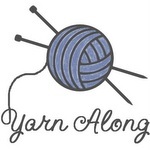 You have to sign up for a free account but this site has so many free and to pay for patterns, tutorial information, message boards, yarn information (in both knit and crochet), it is just phenomenal! My husband and I (with a baby in tow) went on a trip almost two years ago. While we were away, I purchased a LONG book on The Wives of Henry the 8th (actually that might even be the title). It was fascinating; although, I haven't quite finished it yet. Enjoy! Your knitting is beautiful! I am so impressed. Beautiful scarf! I really enjoyed Constant Princess. It really made me wonder more about Catherine and what her life must have been like. And all she sacrificed for her faith and her child. Do you listen to the "Stuff You Missed in History Class" podcast? Some really fascinating stuff! I just listened to one on the young Queen Elizabeth that included quite a bit about Henry's wives. There's also a recent episode about Catherine of Aragon's younger sister, Joanna (Or Juana la Loca). All the episodes are free on iTunes.